Geoff and I have just been visiting Western Australia for the past 8 days, hence the absence of posts. We had a lovely holiday exploring Perth and some surrounding areas, and also had some very delicious meals which we will post about this week. I don't usually equate winter with salads, but this one is a real exception. 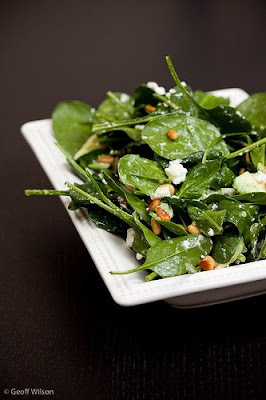 The mixture of the spinach with the roasted pine nuts and feta is delicious, warm and comforting, perfect for a beautiful winters evening. Wash the spinach under some water, drain it and add it to a large bowl. Crumble a good amount of the Bulgarian feta over the top of the salad. I really would recommend that you use Bulgarian or another similar feta that is quite soft and crumbles easily so that it melts and creates a delicious creamy dressing once you have added the pine nuts - Greek feta simply does not do this. Toast the pine nuts in oil with some salt - be very careful as they cook quite quickly. Pour the pine nuts over the salad, as well as any remaining oil. Carefully mix the salad allowing the oil to melt the feta and cover the spinach leaves. If you are so inclined, add in some sliced avocado as a delicious extra. Enjoy alone or as a side dish - we had this with some chicken breast marinated in mustard, honey and soy sauce.